Technically I wouldn’t call this a brace, but it represents the beginning of that life for me. It’s a stand I would be placed in to help my muscles start being able to bear weight (I think). When most kids get new braces, it involves a trip to the orthodontist. 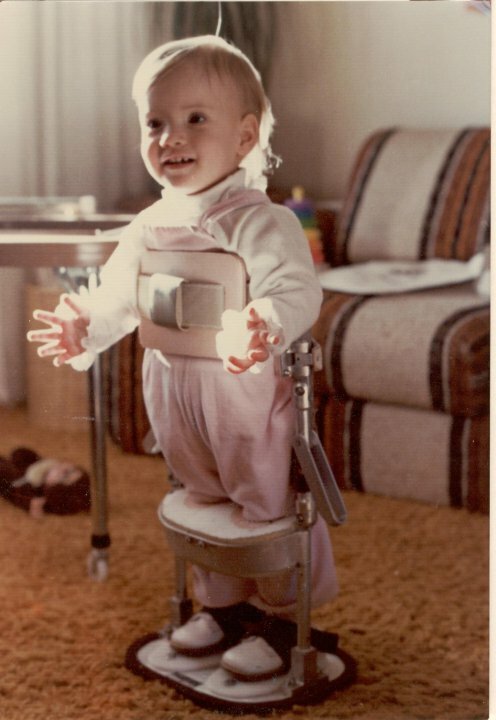 I did experience that, but in my world braces always meant contraptions on my legs to help me walk. When I went to being a full-time wheelchair user in my late teens/early 20s, I stopped wearing leg braces. To be perfectly truthful, it was in part because I gained so much weight in college that my braces didn’t fit anymore. But at the same time, they weren’t needed because I wasn’t walking. Or so I thought. I still don’t know if a brace early on would have helped my bad knee situation, but I have a feeling it might have. While my bad knee is really just becoming public, it’s been a painful problem for years. Every time I had to stand up to transfer or have my chair folded and pulled through a narrow doorway or climb up stairs or climb up into my chair from the floor…the experience was excruciating. Even standing up to get dressed is uncomfortable at best. I’ve just grown used to it and limit my trips to homes where I have to get on the floor or stand up to get into places where my wheelchair doesn’t fit or crawl up stairs. I’m less and less comfortable putting pressure on my bad knee because I can now visualize exactly what is happening. Instead of being worried that I’ll snap my ligaments, I now know the ligament has been so damaged for years (possibly dating back to my knee injury in high school-we just don’t know) that the ligament is considered not even there. There’s also the factor that it’s become increasingly painful and even daily activities like driving can be difficult sometimes. This is the customized brace we tried to make work. It goes too high on my leg and my calf muscle is so atrophied that it won’t hold it up. I’m sitting on the edge of my wheelchair seat (about to fall off) and off to the side just so I could get at the right angle to get the brace on. The truth is, we don’t know what’s next with my knee. I was fitted for a customized brace but that didn’t work, even with extra attachments. The problem is, all knee braces, custom or not, rely on the person’s calf muscle to hold it up. I have no calf muscle because of the Spina Bifida causing paralysis below my knee. My legs are very, very atrophied. An additional problem is, I have way too short legs and in effect, they get even shorter when I sit down. 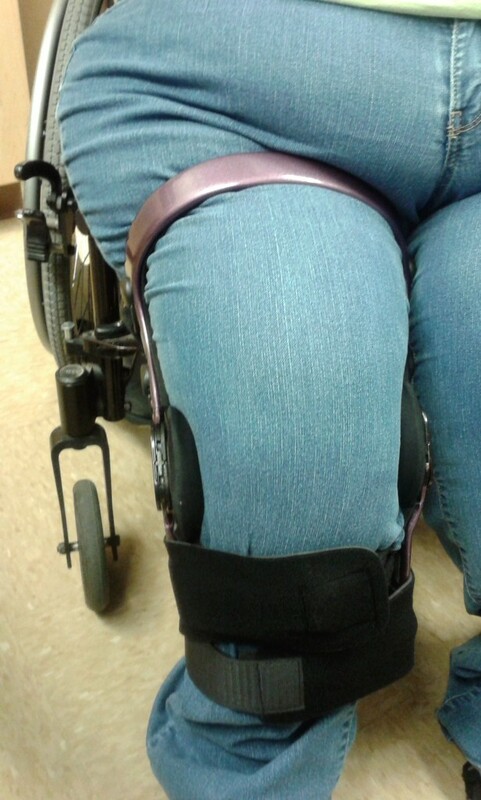 The top part of the brace came so high that it made the brace in my way when I had to drive or go to the bathroom and any time I would lean forward the slightest bit it would move the brace out of position. I’ve been referred to another, more specialized orthopedic surgeon to see if there are other options. 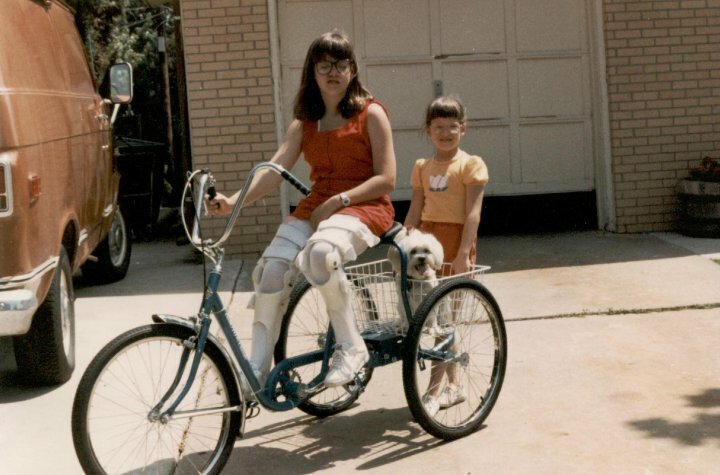 I started out with short braces (the kind that go below the knee) and later on had to get full-leg braces. In high school, it was determined that a new kind of brace would let me have short-leg braces but a boot inserted would protect my knee. I’m no longer convinced that it was protected but at the same time, I have to admit that my other knee is just fine. So, I don’t know and ultimately it doesn’t matter. I can only deal with the now and the future, right? The braces were both just a part of life and a pain. My skin would get caught in the hinges and I got frequent skin infections from the lack of air to my skin from the plastic. But as I said, they were just a part of life. I never thought “woe is me” or anything, it was just something I dealt with. 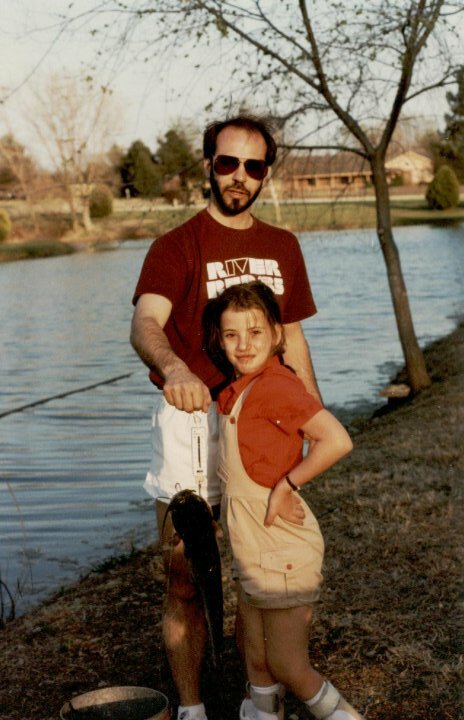 Sometimes my braces were the shorter version. In elementary school, I was put in long-leg braces and had various versions of them until late high school. Yes, that’s an adult trike. Yes, I rode it. If nothing can be done, I guess I will do what I always did when I got new braces: Adapt. Learn new habits. Move on. The pain and suffering you have dealt with surely is alleviated by that picture of you on the trike…? 🙂 Seriously, thanks for sharing this part of your life. I imagine it is hard to let the not-so-pretty reality of a disability intrude on a usually upbeat life journal, and I appreciate your honesty. I appreciate your honesty too, Jamie. We get to see the real you. And we love the real you…. just sayin’. :) I can’t imagine, nor would I even pretend to imagine the pain you’ve endured. What’s that song again…. “What doesn’t kill you makes you stronger?” I think that may be true, though cliche. Because you are one strong woman.